Work-life balance can be crucial to anyone’s success and well-being. And for busy entrepreneurs, it seems like it would be an especially big challenge. Turns out -- that may not be the case. In a recent study by HSBC, 83 percent of successful entrepreneurs around the world say they believe they have a healthy work-life balance. However, that doesn’t mean they’re not working long hours. Analyzing and comparing 4,067 high net-worth entrepreneurs, the study uncovered surprising findings between the different ways entrepreneurs in various regions of the world spend their time. Out of Europe, the U.S., Asia-Pacific and the Middle East, entrepreneurs in Europe dedicate the most time to personal activities such as relaxing, socializing and sleeping. On average, a European entrepreneur will spend three hours and 24 minutes unwinding and seeing friends outside of work. And when it comes to snoozing, these business owners tend to spend at least seven hours and 48 minutes getting some zzz’s. That number is even higher for the Swiss, who manage to get eight hours and 36 minutes of sleep every night. However, just because they prioritize sleep, family and friends doesn’t mean they’re not dedicating a majority of their time to business -- in France, the average entrepreneur spends 10 hours and 36 minutes at work a day. In the U.S., American entrepreneurs tend to spend a little more time at work and less time socializing or snoozing. The average working day for an American entrepreneur is 30 minutes longer than that of a European, with slightly less time spent on personal activities. However, when they are outside the office, Americans aren’t relaxing and socializing as much as their European counterparts. Instead, their personal activities consist more of caring for their children and household management. In the Middle East, it’s all work and little play. 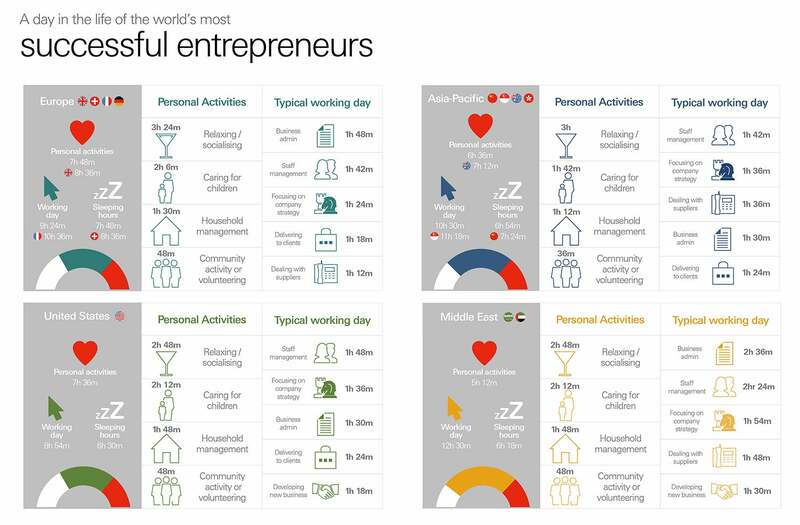 Entrepreneurs in the Middle East spend the least amount of time on personal activities, instead spending long hours at work. The average working day for one of these entrepreneurs is a whopping 12 hours and 30 minutes, with only five hours and 12 minutes to spend on themselves. Compared to other entrepreneurs across the globe, these Middle Eastern entrepreneurs also get the least amount of shuteye at night, clocking in around six hours and 18 minutes every night. Being a workaholic doesn’t seem to phase them though -- 86 percent say they achieve a healthy work-life balance. The case is similar for entrepreneurs in the Asia-Pacific, however they seem to strike a better balance than those in the Middle East. While a typical day can amount to 10 hours and 30 minutes, at least these hard working entrepreneurs are getting a good amount of sleep (six hours and 54 minutes) -- more than Americans and Middle Eastern entrepreneurs. Like Europeans, they too prioritize relaxing and socializing outside the office, dedicating at least three hours a day to these activities, and less time on caring for children, household management and volunteering in the community. Out of all regions, entrepreneurs in the Asia-Pacific have the lowest proportion saying they have a healthy work-life balance (76 percent). The U.S., Europe and the Middle East each have more than 85 percent of their entrepreneurs agreeing that they are happy with their balance.